Online TV re-broadcasting company Aereo have revealed that subscribers to the service will soon be able to watch content easier, and wirelessly on any HDMI equipped big screen TV, after the company announced support for the Google Chromecast dongle. Although Aereo users can already stream OTA traditional TV broadcasts to a variety of devices such as computers, tablets and connected TV’s,as of May 29th they will be able to wirelessly send signals back to the TV from any Android tablet or phone by using the cast button. Google’s Chromecast stick which was launched last year in the US, is a receiver for compatible apps that takes over the job of receiving streams and displays them on any TV it’s plugged into. Currently the $35 stick works with a number of mobile streaming services including Netflix and from any Chrome browser. The Aereo service which is available at present in 11 areas including New York, Atlanta, and Miami offers streaming access to local TV broadcasts from providers such as ABC, NBC, CBS, Fox and PBS as well as a cloud-based DVR service from $8 per month. Before the Chromecast option gets added Aereo will be facing their day in the Supreme Court as they fight against chages of copyright infringement by the TV networks. The Google Chromecast wireless streaming dongle has been a rip-roaring success in the US since launching last summer, and the rest of the world have been waiting with baited breath for a release in their own Country. And finally good news for UK viewers as a launch has been announced for March. It will mark the first territory outside the US to get the low cost HDMI stick that lets you stream content from your PC, phone or tablet straight to the big screen TV. Currently the tiny stick supports popular streaming models such as Netflix, Youtube and Google Play Movies. 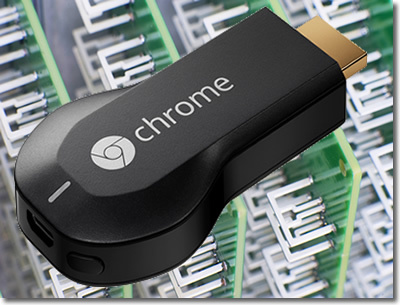 It would be expected that UK catch-up services such as iPlayer, ITV Player, 4oD, Demand 5 and Sky Go will add Chromecast compatibility in time for launch, or users can just run streaming services from the Chrome browser. Once an app or streaming website is running on a users device, they simply press the cast button and the stream will start running on the TV with Chromecast connected. No news on the cost although in the US it retails at $35, that will probably equate to around £40 in the UK. Although the device is in such high demand they had been selling on Ebay to UK owners for up to £125. Electronic retailer Currys are said to be stocking the stick from March 1. The news comes just after Google opened the Chromecast SDK to third party developers, which should result in a flood of apps and services that make use of the Chromecast’s abilities. Google have launched a suite of developers tools that will bring a whole host of wireless streaming compatibility with the best selling TV dongle. The $35 Chromecast launched last July, is a HDMI stick that once plugged into any TV transforms it into a wireless streaming Smart TV, giving access to web and video content such as Youtube and Netflix. The stick was an instant bestseller and sold out within 24 hours of launching. It is still a bestseller on Amazon. Now that Google have released it’s Google Cast software development kit, developers can create and publish apps and software for the Chrome browser, Android OS and Apple iOS devices. Compatible software running on PC, tablets and phones gives users the ability to ‘cast’ any running content to any TV equipped with a Chromecast stick. The Chromecast launched with a limited support of services, but they were the important ones in Netflix, YouTube, and Google Play Store video. Hulu Plus and HBO Go were added, swiftly followed by 10 more apps that included Pandora, Vevo, Songza, PostTV, Revision 3, Red Bull.TV, BeyondPod, Plex, Avia, and RealPlayer Cloud. The recent launch of Google’s new TV streaming dongle, the Chromecast has stirred up a lot of interest, not least because it makes it simple to cast or mirror streaming media wirelessly straight from your computer browser, smartphone or tablet onto your big screen TV set. There are also other options to get the movie or show from a PC or mobile screen to a big television screen. Here we look at the options to stream, both the old fashioned but simple wired way, and the cooler and getting easier by the day wireless way. Currently to get the same effect, most people use a wired connection such as a HDMI or similar cable to connect from a laptop or PC to the TV set. For mobile and tablet devices a MHL cable can be used. MHL sends media from a number of supported mobile devices to a HDTV using a thin cable, this cable provides power for the connected device and charges it at the same time. MHL supports upto 1080p HD Video as well as 7.1 surround sound. There are a selection of MHL devices available from TVs to Blu-ray players, cables, monitors, projectors, smartphones, tablets and more. There is also an MHL-HDMI adaptor for devices that are not MHL enabled. Also with MHL you are able to control the attached device by using the TV’s remote control. However simple and efficient a HDMI cable is, there are instances where you may not want a long wire tailing across a room, or it may not be practical. But if you are looking to wirelessly send movies, shows and music, do you need Chromecast or Apple TV in your life, or can you make use of the other video sending options that are currently on the market? We take a look at the different options available to mirror, cast, send, stream or throw content to your television set. The thumb sized Chromecast dongle plugs into your televisions HDMI port and ‘casts’ media from any compatible app running on pretty much any device including PC, mobile phone and tablet (android, windows 8 and iOS), to the chromecast via the cloud. It is a neat system and your sending device also becomes the remote control. Once plugged into your TV a WiFi connection needs setting up and you’re good to go. Compatible with – Any device running Android 2.3 and above, iOS 6 and above, Windows 7 or 8, Mac OS 10.7 and above, Chrome browser. What can be streamed? Compatible apps with the Chromecast button which include Google Video, YouTube, and Netflix currently, and any content can be streamed from the Chrome web browser. The service that started it all and everyone is familiar with, especially those owning an iphone or ipad is the Apple AirPlay feature. Airplay works by using the Apple TV STB (set-top box), or any third party licensed hardware as the receiver and lets you stream or mirror video, audio and even apps and games from the sender which is any other Apple device running itunes via the home Wi-Fi network. It works great but it only works within the Apple ecosystem and simply mirrors what is on your mobile device, so you have to have the same thing running on 2 devices until you are done. Compatible with – Sending unit Apple Mac or iOS device such as iPad 2 and above, iPhone 4S and above running iOS 6 and above, receiver Apple TV and compatible Airplay devices. What can be streamed? The service mirrors whatever you are running on your Apple device so games, apps, streaming media and music etc. DLNA is a standard that allows you to share media across the home network, DLNA has the advantage that it works over Wi-Fi as well as Ethernet and can send files . This enables you to play any media such as video, pictures and mp3 audio onto a DNLA equipped TV sets as well as more mundane tasks such as printing a document without plugging the printer in. A DLNA system uses the UPnP (Universal Plug and Play) protocol to discover what device it is connected to and whether it is sending unit (server) for the media, a TV that displays the media (renderer) or the player that determines how the media is displayed (controller). DLNA specifies the media types and playback characteristics that the connected devices then make use of. The DLNA system is somewhat restricted and cannot use almost all free video and audio codecs and therefore needs to transcode the stream on the fly before sending it to the receiving device. Both XBMC and PLEX media centers have the ability to use the DLNA standard, XBMC when setup can receive media pushed by another DLNA enabled device. DNLA systems need both a server and client, the client can be any device with DLNA enabled. 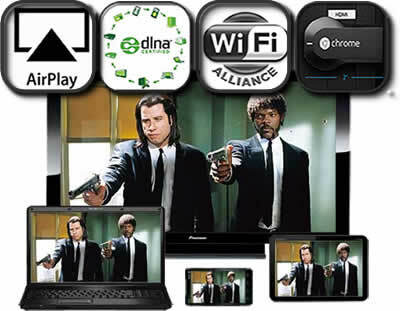 With more than 18 thousand DLNA devices on the market they cover everything from computers and Blu-rays to smart TV sets. Apple devices are not DLNA enabled as they make use of the in-house AirPlay system. Compatible with – Computers, Smart TV sets, Blu-Ray players, streaming boxes, game consoles, tablets and phones. What can be streamed? The service connects to the home network using the UPnP protocol and can play video, pictures and music by transcoding on the fly and using the receivers media player capabilities. Miracast runs on a similar principle and works as an alternative to AirPlay, but it is an open standard rather than a closed shop like Airplay. The system is built on top of WiFi Direct and acts like a wireless HDMI connection where everything gets copied from one screen to another using H.264 codec and its own DRM system. The system operates similar to screencast, which is a realtime screen capture of computer screen output. But, does not record the video to your hard drive instead it streams the video captured over a network to a device which has a screen, like for instance a TV set. Miracast can handle upto 1080p video and 5.1 surround between two connected devices, both devices need to be Miracast enabled. Many devices support the miracast standard and there are adapters available for devices without Miracast that can plug into usb and hdmi ports. Compatible with – Runs on devices running Android 4 and above, generally in tablets and phones, the standard is also expected to be available in Windows 8.1 and Blackberry 10.2. Samsung already have Miracast solutions on many of it’s products. What can be streamed? Movies, shows, music and games running from compatible apps. The Slingbox kind of does wireless streaming but in a back-to-front way. Instead of sending web content to the big TV screen, it enables the sending of cable TV content from your home, to anywhere you happen to be in the world that has a WiFi connection. Slingbox is a simple looking set-top box which you connect to your TV at home, then you can send that signal on the screen to another connected device in real-time. It can be great for travellers that want to watch the cable they pay for, and it bypasses international broadcasting restrictions as well. So there you have a number of alternatives and solutions to move your media files around devices you own. Hopefully a standard will soon be set that comes pre-installed on all devices and is as easy as pressing a single button. But until then you can achieve the wonders of mirroring content, but you just have to work that little harder. There are a number of wireless USB options for an easy way to connect your PC to the TV set. They work by plugging a HDMI dongle into the TV and a corresponding wireless USB dongle into your computer. They will work with any TV and PC combo and will stream whatever is on the PC straight to the television. Drawbacks include a limited range of around 10 feet. Now you know how to stream wirelessly, visit our list of free movie websites and check out our guide to cutting the cord. For the longest time, media players and Smart TV have been offering the ‘true’ web browsing experience, allowing viewers to watch on-demand television from popular sources like Netflix, Hulu, and the like. This adds a new dimension to television entertainment, but there has been one major flaw with these boxes: viewing videos from licensed television networks like CBS, NBC, and BBC is simply not possible (at least not without a dedicated app). The sites are coded to prevent non-computer web browsers from playing their content. The only way to view these clips on a television would be to connect a computer to it via the ever fading VGA cable or a HDMI cable. Netgear’s latest product, the Netgear Neo TV, seeks to remove this requirement entirely by incorporating a new feature called WiDi, short for Wireless PC Display. By simply networking a computer and the box and hitting a button, the viewer can watch their anything from their computer on their television screen. This allows for easy streaming; rather than downloading a separate app for Netflix or Hulu, the viewer simply starts it up on their laptop and enjoys the film from the television screen. WiDi was created by Intel (who are currently creating a new TV service), and is integrated into many new laptops, and even smart TV sets. It allows for direct mirroring of displays over networks, rather than requiring a hard connection. This simple innovation is for the first time integrated into Media streamer, and if it is successful, may mean a whole new take on video entertainment. Of course there are downsides: only about one hundred laptops currently use WiDi technology, all of them newer models. In order to make use of WiDi receivers, a laptop upgrade might have to be made. Some may find this an acceptable option, but paying between $499 and $899 for a laptop for the sake of ease may be a little steep. Of course, if you intended to pick up a new laptop anyway, make sure to keep an eye out for the little WiDi sticker.